Fake wedding cake – hmmm! UPDATE: If you are visiting from MSN Smart Spending, welcome to Miss Thrifty! My passion for fashion knows no bounds, but neither does my craving for saving… Bargains ahoy! Please have a look around; if you like what you see, subscribe to my RSS feed. Thanks for stopping by – Miss T.
That’s real icing; but the “cakes” within are made from foam. A couple can rent out a cake such as this one for their big day, then return it to the cake rental company when their wedding is done and dusted. I’m not sure if the wedding guests are supposed to know when the cake is fake: it seems kinda cheap to broadcast the fact, but wouldn’t you feel a little uncomfortable if the cake was on a stand or table, with people cooing over it, if you were keeping schtum about it not being real? Maybe that’s just me – but I take my cakes very seriously, I’ll have you know. So, are you wondering what happens when the “cutting the cake” ceremony rolls around? Well, these cakes all come with one bona fide slice of wedding cake, slotted into a triangle-shaped slot in the polystyrene. So you can cut into your cake with all of the pomp that the occasion calls for – and if you so choose, your guests are none the wiser! The cake is whisked away; backstage another (cheaper) cake is cut into squares that are then brought forth, for your guests to take away with them. Neat, huh? The company that does these cakes is called Cake Rental.com – and it is doing so well right now that it is about to roll out a franchise operation. It’s true that wedding cakes cost an arm and a leg. The best wedding cake I ever saw was some years ago in Harvey Nichols, and it was made by a Glastonbury company called Just Scrumptious cakes. I recommend that you visit their website and check out the Kissing Fairy Castle cake, if only to gawp. Amazing, isn’t it? Sadly when my own wedding rolled around, a cake of this magnitude wasn’t really accounted for in the budget. So my own thrifty wedding cake solution was to make my own: a four-tier affair with fruit cake on the bottom, then chocolate cake, then banana cake – plus a little diabetic cake on the top for my dad. Marzipan, white fondant icing and sprays of multi-coloured, lifesize sugar rose cascades. Yes, I was mad. Although the bright side was that I was able to channel all of my madness into this crazy cake and thus avoid the Curse of Bridezilla. Bridesmaid dresses? Pah! I was too busy having sleepless nights over edible pigment powders and dowel supports. No, I wouldn’t do it again in a million years. Even now, the dreaded word “sugarcraft” makes me shrink into my swivel chair. 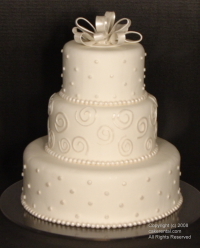 Wedding season is approaching, so if you have any additional suggestions for thrifty wedding cakes, please share them! This is the most mental thing I have ever heard! Whatever next? Hire a dress for your photos but get married in a different and cheaper one? Serve cheap fizz in Krug bottles (although I’m sure it’s been done)? Should I ever get married the cake would no doubt be one of the highlights of my day, you couldn’t pay me to have a fake one on display. However, I do agree that they are ridiculously overpriced and if I do get married I would like to try making my own one too. You should check out the cakewrecks.blogspot.com for some amazing and not so amazing wedding cakes. What you didn’t seem to mention (or perhaps I skimmed too quickly?) is that the idea is to then have regular sheet cakes to be passed out to the guests. And, frankly, Holly, if you’ve ever priced wedding cake for 50-100 people, you might not think it was such a bad idea. Most cakes start around $2-3/person. That’s for the simple designs. We were actually going to go with Sam’s Club. They make rounds for about $10 each. Then you can buy styrofoam pillars (from Sam’s also) for about $13. Dress the pillars up however you like (tulle, flowers, whatever) and voila — affordable cake for the masses! We ended up not using this, though, because a friend of a friend loved to make cakes. So we got some of the best chocolate cake I’ve *ever* had (and regular icing under the fondant, so the best of both worlds — aesthetics and taste!) and our friend covered the cost (other than materials,which we bought) as a wedding gift. Also, if you check out Craigslist, there are often people trying to break into the cake biz who will charge less because they’re trying to build a portfolio. It seems a logical way to cut the expense if you can sell the act. Otherwise, you look cheap and cheesy. And if you’re going to look cheap, then BE cheap. This is crazy – LOL! So glad I never had a wedding. The pressure to present a “perfect cake” is just icing on the financial cake. I actually had a fake wedding cake, but not like the one described. My father in law designed a cake covered in glass with waves and a crystal dolphin set on top. We then had a small, real replica and three sheet cakes to supplement. It was wonderful. Now we have a memorable memento from our wedding that we can keep forever, and we got to have tasty wedding cake for about a third of the price. I believe it’s quite popular in the States, but becoming more popular over here too. Anyway, who’s going to know that it’s not the real deal? You pose for the cake cutting photos and then most cakes get cut behind the scenes by the caterers, so no one will know that you’ve used a cheaper cake! ha ha fake weddings cake!!!!!!!!!! I chose to go with an online company called http://www.fake-cakes.co.uk for my wedding cake. I had the cake I’d always imagined I would have for my wedding. It was perfect! And it didn’t cost the earth!!! Im having the bottom two tiers real cake, and the top 3 fake. So we get the best of both worlds! I want the WOW factor but we’re on a budget…..but Im not so tight that I’d buy the whole thing fake. Its a great idea, and fun choosing, because the designs are amazing, and so cheap. Sounds like theres some jealous peeps on here! You can hire wedding cakes that have a secret compartment where you can place a slice of real cake, so you are still cutting the cake. The cakes do look amazing but they are not cheap as you are paying for the time it takes to decorate. If money is tight you would be better off buying a wedding cake from a supermarket and then decorating it yourself. Many times, two layers are fake(made of foam) and then the one layer is real allowing the cake to be cut in its traditional ceremonious way! It really is a safer and cheaper option as flat cakes cost much less(about $2-3 less per slice) than a custom fondant topped, three tiered wedding cake. I was at a wedding recently where the top three layers of the cake were polystyrene, iced to look like the real thing. The only layer that was really cake was the bottom one (the one they cut in front of the guests). Then when the cake was taken away to be cut for the guests, a substitute cake (a cheap one) was cut and brough out for the guests. Guess what, nobody noticed. Brilliant!